As she reached the ground floor, ten-year-old May Malone looked back up the stairwell to see her mother still holding the burning piece of paper at the top of the house. An orange glow flickered through the shadows, briefly illuminating the crumbling wallpaper and the chipped cornices. And then the flame went out and the house was darkness again. There was still plenty of noise, as you would expect from a house with over eighty residents. May opened the front door and walked out onto Henrietta Street. May, the eldest of ten children, was born in 1945 and spent the first decade of her life growing up in a single room on the top floor of a decrepit four-storey townhouse, No. 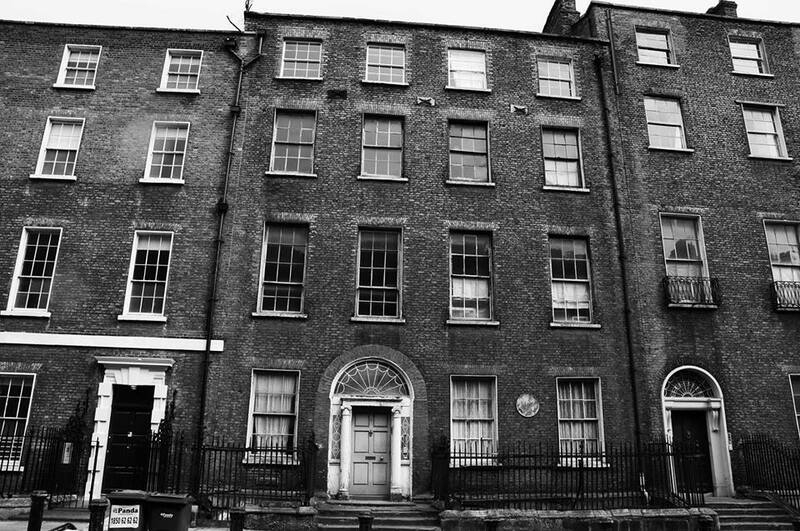 7 Henrietta Street. She shared this one small room with her parents, her grandmother, her uncle and four of her younger siblings. May is unsure when the Malones first moved into No. 7 but it was probably in the wake of the Great Famine. By the time of the 1911 census, nineteen families were living in No. 7, comprising 104 men, women and children. And at least sixteen of those families were still living there when May’s father Michael Malone was born at the top of the house in 1922. May never knew her grandfather but she was well acquainted with her devoutly Catholic grandmother Katie Malone who operated as midwife on the street during the 1920s and 1930s. All three of Katie’s sons started work before they were teenagers – Peter as a carpenter, Stephen as a butcher and Michael as a general labourer down in Dublin’s Docklands. In 1943, young Michael went to a dance and met Cathleen McCabe, a butchers daughter from Viking Road. After their marriage, Cathleen moved into her husband’s home, a solitary room at the top of No. 7 that he shared with his mother and brother Peter. By 1955 there would be nine Malones living in the same room, five of whom were children. And when uncle Stephen came to stay with his wife and daughter every Christmas, as he insisted on doing, that upped the number to twelve. ‘There was a partition in the room to make it into two rooms,’ recalls May. ‘In one part there was a range cooker where we lit the fire. And there was a double-bed where my mother and father slept, a dresser with all the plates on it, a table and a couple of chairs. Most of us sat on a side of the bed when we ate’. From the Malone’s room to the street involved eight flights of steps, six narrow zig-zag backstairs, followed by two rather more formal sweeping staircases down which the upper classes had strolled 150 years earlier. In the darkness of tenement night, with no lighting in the house, the residents crept carefully up and down the steps, keeping close to the wall, with perhaps a burning wax candle or a lighted piece of paper from above to guide them. Sometimes they’d have to step over a sleeping drunkard who’d been locked out of a nearby hostel – ‘the spunkers, we used to call them’. ‘The street was all gas lamps at that time,’ says she with Dickensian delight. ‘I remember the lamplighter would light them all up whenever there was a big ball up at the King’s Inn for the barristers. We’d watch all the carriages going by, lit up by the lamps’. But her mother was never happy in Henrietta Street. When she returned home from the Rotunda Hospital with baby May in her arms, Cathleen was appalled to find there wasn’t even a crust of bread in the house. She vowed to get her family out. The sorrow and hardship of inner-city life was always present in the tenements. During the first decades of the 20th century, huge numbers perished from cholera, typhoid, influenza and tuberculosis, including one of May’s uncles. This entry was posted in Henrietta Street History, Labour History, Social History, Tenement History and tagged Dublin Tenements, Henrietta Street -- Dublin, Irish History, May Malone, Turtle Bunbury. Bookmark the permalink. I Love reading about old Ireland, this is where my ancestors hail from and this article is especially interesting because my gg gf married Mary Maloney – I now see that this could have also been Malone. Any how, I am in Aussie and love reading this. Am from Dublin going home next month married an American,was born lived in summer hill cabra west and ringsend one brother moved to England other three still home all still at home lived in tenements lots of kids playing outside lots of noise but also lots of fresh air and fun. My mother lived in No 7 until she was five. Both my grandparents grew up on henrietta street. David Buchanan & Esther Reel. Love reading these stories. My mam left Henrietta St in or around 1933-36. They moved out to East Wall. I would love to hear any stories or information you have on the Buchanan family. My Mam is 84 now and not very well but she loves going down memory lane.